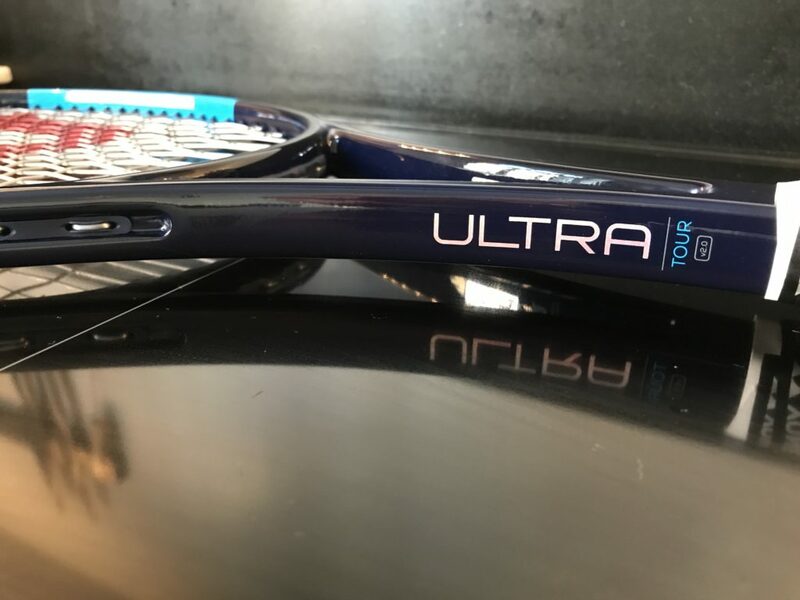 I’ve had a first hit with the Wilson Ultra Tour and want to give you my initial impression about this much talked about racquet. Full review to come. The test racquet I have is strung with Luxilon Alu Power . It’s not my string of choice, but it works alright in the Wilson Ultra Tour. For the next couple of session I might string it up with a more spin-friendly string since the trajectory of the 18×20 is rather low. Compared to the Angell TC 97 Custom 18×20 I’m playing with at the moment, I really feel like I get less spin with the Wilson Ultra Tour , but a string pattern comparison to come in the full review. The Wilson Ultra Tour is a light racquet for a commercial tour model and in my opinion it cannot be used effectively without customization. You simply won’t get enough power on your shots. I don’t know why Wilson didn’t add a leather grip on it, but I would definitely recommend that along with some lead tape at 3 and 9 and/or 12′ o clock to pack more punch into the racquet. As a control and touch-and-feel racquet, it really shines. Despite feeling a little bit too low-powered even when I added lead at 3 and 9, it made me feeling creative. Usually I really on my forehand and aggressive tennis, but the Wilson Ultra Tour made me want to slice and dice and drop-shot, move into the net and play funky tennis. And that’s a lot of fun! Here are some rallies from a practice set I played with the Wilson Ultra Tour. We’re both testing new racquets with demo strings so quality of rallies is not that high, but hopefully I can bring some higher quality tennis clips soon. Comfort is not an issue with the Wilson Ultra Tour. In parallell I’m also play-testing and review the Wilson Ultra 100 CV and it will be interesting to see how Countervail works there to dampen the high RA rating of 71 strung. The Wilson Ultra Tour however needs no Countervail, it is a plush, low-powered racquet with a really nice and clean feel. I would say it feels very similar to a good old HEAD iPrestige in how it plays. Would I take a customized Wilson Ultra Tour into a tournament? Without doubt. I need to find my ideal spec and string for it, but once that’s done it is a pro stock level racquet for sure. Is it better than the Angell TC 97 Custom? I would say they are very close in how they play and it’s too soon to pick a winner at the moment. I will make a in-depth comparison later on. Are you interested in the Wilson Ultra Tour? What do you think about it? Please comment below. If you want to get a Wilson Ultra Tour or other tennis supplies, check out the online shops below. Is it similar to the old nblade 98? Quite similar. The nBlade is more head-heavy, has the 98 inch head size, and is actually more flexible and low-powered (RA around 58). I would say the Wilson Ultra Tour plays more like a HEAD IG Prestige MP or iPrestige even, but the nBlade isn’t that far off. Every time you serve to the deuce court you are committing a center line violation foot fault with your right foot; it doesn’t matter where your feet end up during the service action – otherwise you could walk to the net and jump in the air and claim a legal serve lol – your right foot can’t be grounded over the imaginary extension of the center line service mark at the start of your serve. I am currently use a Yonex EZone DR98. There´s a difference between the Wilson Ultra Tour and the Yonex EZone DR98? Yes, the Ultra Tour is more flexible and less powerful than the DR 98. You’ll get more “feel” and control however. Both are good racquets, the Ultra Tour is more old-school and the DR 98 is a great modern racquet. Which one swings easier, faster and has a bigger sweetspot? Your modified Wilson Ultra Tour or your Angell Tc97? Easier to swing – depending on the specs. In stock form the Ultra Tour, but you need lead on that one for it to play more stable. Biggest sweet spot – I think the Angell racquets are slightly more precise, but have a smaller sweet spot. 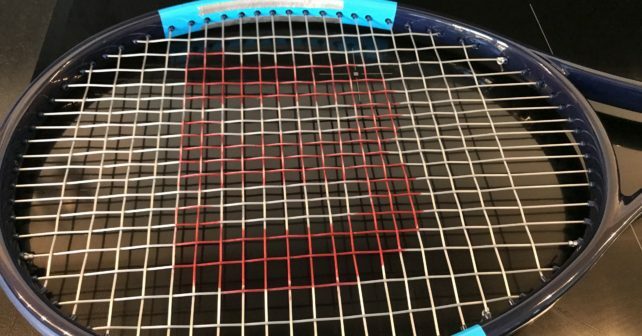 Either racquet should serve you well if you’re into a control-oriented frame. I myself have a hard time deciding on which one to choose for the 2018 season! What qualities do you like better from each racket so far? I’m leaning towards the Angell – I just feel it pocket the balls slightly better and I’m slightly more connected to the ball. How do you compare Ultra Tour Vs Wilson Blade 98 2015 18×20? I’m currently playing with the blade with a solinco tourbite 17 (started with 24kg but dropped to 20kg) but i’ve developed tennis elbow last few months and it bothers me alot, sometimes very painful after a game. It is slightly better since I’ve dropped the tension tho. I’m not sure what to change first, the tourbite 17 to tourbite soft or change the racquet completely with solinco tourbite 17 string. I’m reading a lot of good stuff about this racquet and kinda excited about it, tho not sure if it is worth it at this point to drop 225 euros on it. I’m the aggressive baseliner type of player. I played with the Wilson Blade 98 2015 18×20 for a while and struggled with similar issues as you, some arm discomfort. I think a softer poly would help and should be your first try and the Solinco Tourbite Soft is a great option, but if you still feel discomfort, I’d definitely check out the Wilson Ultra Tour. It’s a great racquet and I’m sure your arm will feel better for it. Maybe your best option is going for a Wilson Ultra Tour with a soft poly or a poly/gut or multifilament hybrid? But I understand that the price point is a pain point so maybe start going softer with your current racquet and then move to the Ultra Tour. I Find the UT a really good doubles stick. I can get good spin on ground strokes but only if I hit a little higher than normal on the string bed. You have to work really hard to get the same spin you could get from any “modern” racquet. I find the UT really good when I get inside the baseline. My challenges with it are spin and put away power. I’ve been using VS gut and 4G at 53/48 to give me a little more pop. I may try Solinco Hyper G to up the spin. I’d imagine I’ll have to go pretty low to get the same jump off the string bed. The ultra tour is the best head racket ever made by wilson. Got an old Trysis 280 lying around and they are exactly, bingo! Forget about playing it stock, this is a tinkerer’s dream! Got mine professionally lengthened to 27.5 just 3gr of lead on 3 and 9 o’clock. Swingweight 330+. Feels like the wind is constantly blowing from behind you. Hitting serves feels like cheating. Strings Alu rough 36lbs. Happy you like it! Sounds like a good spec too!